I am officially in love with the We R Memory Keepers Love Notes collection I got from the Paper Issues store. From the name, you'd think it was a Valentine's Day/lovey dovey collection, but really isn't. 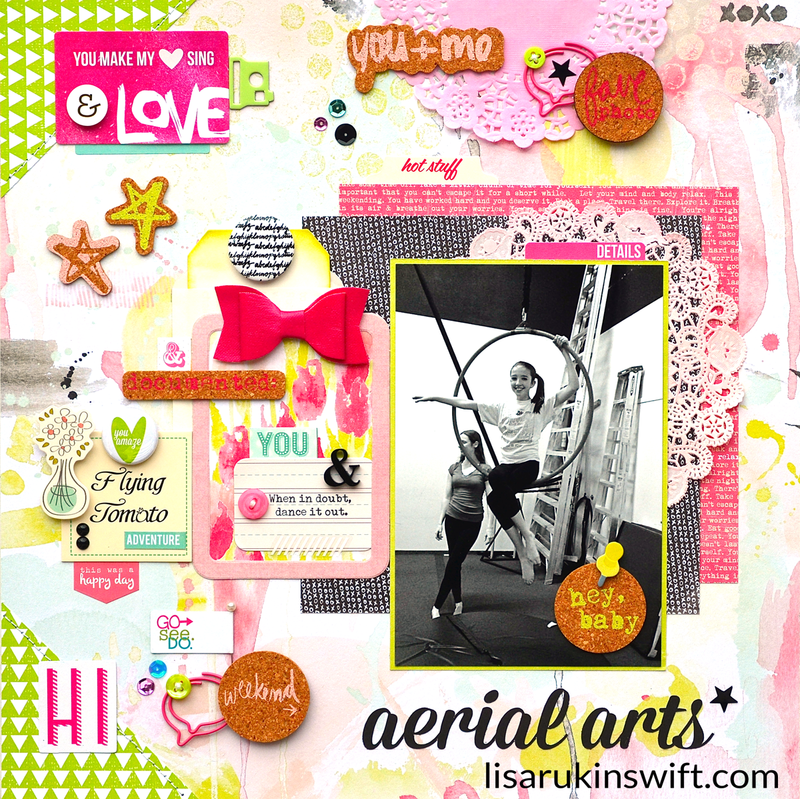 It's perfect for using with every day photos, like I did on this layout about an aerial arts birthday party Alexa went to. The coordinating cork embellishments are awesome, coming in all sorts of shapes and sizes. I love them mixed with the metal and chipboard pieces I used on here. I also added in a piece of my favorite flair ("you amaze") from my friend Elise's (lilgik) Etsy shop. The flair is 7/8" so it's smaller than your typical flair. If you love this collection as much as I do, use the code LISA20 to get 20% off when you shop at the Paper Issues store. Love this - so bright and fun - your layers amaze me. Wow, Lisa, gorgeous layout, love those colors and the detail of the teensy stitched buttons on the shaped clips is too cute!! It's easy to see what you love about this collection! Fabulous layout! Loving all the bright pops of color and the cork pieces! Fabulous page and such a fun picture!! Love the bright colors in the collection!! This is so fun Lisa! I love the bright colors with the Black & White photo! I also like all of the cork. This is so cool and so fun! LOVE IT! Love, love, love all the cork pieces on this super cool layout of Alexa!!! Love it and those speech bubble clips that are pink - OMG!!!! Love those and the bright pink bow!! All perfectly cute and fun accents to have around a picture of your fun and spunky daughter!!! Hugs to you!!! Love the colors of this collection. Such a happy page!